Division Rivals is a brand new online mode in FIFA 19. It replaces the Daily Knockouts from last year (and good riddance), allowing players to gradually earn points and enter the FUT Champions Weekend League at their leisure. In this FIFA 19 Division Rivals Guide, we'll break down exactly what the new mode entails, from rewards to requirements. We'll take a look at FIFA 19 Division Rivals Placement Matches, and also how ranking works. For more on FIFA 19, including info on FUT 19, head over to our FIFA 19 Guides Hub. It’s got info on FIFA 19 The Journey, tips on how to score goals, and more. FIFA 19 Division Rivals - How Does Matchmaking Work? When is the FIFA 19 Division Rivals Weekly Refresh? Can You Play Division Rivals Placement Matches Again? What's the Difference Between Division Rivals and Squad Battles? Whether you’re looking to compete in the big leagues, or just looking for a bit more of a challenge than Squad Battles, Division Rivals is worth playing for the rewards. Depending how you perform each week, you’ll earn rewards. These range from Gold Packs, to Loan Player Cards, and are well worth going after. You’ll see your points total and rewards at the end of each week. Thanks to the hard working folks at r/FIFA (specifically user u/twes6, who is building the list with the help of the community) we have a list of the FUT Division Rivals rewards. The list is currently incomplete, but we'll be sure to fill in the gaps when we get more info. Good news FIFA 19 fans, there's a new mode in town. It's called Division Rivals, and it sees players facing off against others in online matchups. Each player is placed into a Division based on their skill rating, and every week is given the opportunity to move up or down for new rewards. It can be a little confusing at first, so let's take a look at the basics first. In FUT Division Rivals, you play a handful of placement matches before being placed into one of ten divisions. There are ten divisions in total, and range in skill level. If you don’t do amazingly well in your placement matches, don’t worry too much. You’ll get the opportunity to move up or down each week, when your skill rating is re-evaluated based on your performance that week. Rewards get better the harder the division, so you should absolutely be trying to move up. You cannot ‘win’ a division, only move up down or stay the same. So why compete in Division Rivals? Well, two reasons. The first is that you will receive rewards at the end of each week. The second is that, by playing Division Rivals matches, you’ll earn FIFA Champions Points. FUT Champions Points are a currency that you use to buy your way into the Weekend League. Once you’ve earned enough, you can buy in whenever you want, a big difference to last year’s system. You’ll earn FIFA Champions Points depending on your performance. Location - your location determines which game server you're placed into, and therefore who you will match up with. Skill Rating - you'll only be matched with players that have a similar Skill Rating to you. Every Thursday at around 7 a.m., FIFA 19 Division Rivals refreshes. What this means is that players are evaluated - their points and performance totalled - and are either promoted, relegated or kept right where they are. The rewards for that week will also be awarded, and all progress will be set back to zero for the upcoming week. Unfortunately, you only get one chance at your placement matches. These will be played when starting up Division Rivals for the first time, and once you’ve completed them, cannot be played again. You can move up divisions by performing each week though, so you’re not stuck in the division you’re initially placed in. At the end of each week, your performance is assessed and you are either moved up or down a division, or stay put. There are three factors that the game takes into account, which we've listed below. Skill Ratings - Skill Points are earned while playing games, for performing well against other players. FUT Champions Qualification Points - FUT Champions Points are earned after each game. These can be used to qualify for the Weekend League. The higher the division you're in, the more Champions Points you'll receive. Upon loading up FUT 19 for the first time, you may be a little confused as to the differences between some of the modes. Well, Division Rivals is an online-only mode, while Squad Battles is a single player affair. 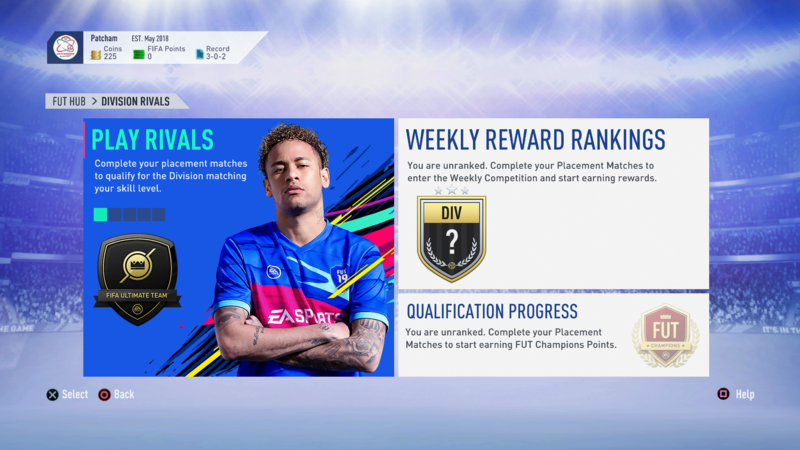 While playing Division Rivals, you earn Champions Points which you can use to enter the Weekend League, in Squad Battles you earn FIFA Coins and rewards. There are 45 matches to play in Squad Battles each week, whereas you can play as many Division Rivals games as you'd like.